I was born in Maine. Neither of my parents are mushers but they supported the addiction when I was young. Former member of DESDC, NESDC, and current member of Gausdal Trekkhundklubb (Gausdal sled dog club). I moved from Maine to Norway in 2008 and rebuilt my kennel here together with my musher-wife, Kaia. I like running long distance. I have guided for many years, but now I am concentrating on running some races and seeing what the dogs and I are really made of. I started Mushing when I was 11 years old. So, about 14 years. What sparked your initial interest in sled dogs? I was a surly kid, and my parents asked me on my 11th birthday what I wanted to do for the day. I said “I don't care”, so they dragged me to a winter carnival in our town. I was determined to have as little fun as possible, so I went and sat down next to the string of sled dogs that where being used to give rides. I sat there for almost six hours and that was it. I was gone. If you remember your very first time behind a team of dogs, tell us about it. I poop-scooped for 11 months before I got my first ride behind a team. The first time I went out was with Liz Como, who runs Winter Journeys Guiding with her husband Andy. After a few hours on the trail, I was feeling like I was getting the hang of it, so Liz sat in the sled and let me ride the runners. I lasted for about 10 minutes before I fell down, ripped off the handlebar and split this huge 8 foot toboggan right down the middle. The only thing holding the two halves together was the brush-bow and the brake. Liz Como and Andy Chakoumakos got me started in this sport. They taught me a ton, most of the basics I learned from them. Caroline Blair-Smith and Andy Bartleet of Mornington Crescent Sled Dogs have been a huge influence on me as a musher and a person. Jennifer Wallstrom gave me my first dog, Yoda. All of them are my friends and mentors. I operate a kennel with between 30 and 40 Alaskan huskies. The total size depends on if I have any other mushers renting space or not. I use a modified drop chain system. I have an anchor point at each end of the kennel, and a big mainline chain running the length with 6 foot chains attached at 14 foot intervals. I like the system because it is quieter than the welded bar system when the dogs move around and it is very easy to move the dogs from place to place. I also have three big heat pens for females, and one big puppy pen that doubles as a heat pen when I don't have puppies. I use standard stainless steel bowls for feeding. Access to water is crucial. The sun is never that intense in Norway so shade is not as much of a consideration, but good hydration is so important. I also have a pet-peeve about wet straw. A dog house with a good water tight roof is a must all year round, and clean, dry, bedding is a must at my kennel during the winter and fall. In the spring, once it gets warm and wet, I will usually take the straw out and let the houses dry. I can always put more in if it gets cold again. We feed and recommend Dr. Tim's Momentum and Vom og Hundemat. Momentum is just a great food. I switched last fall and the dogs have just looked awesome. Vom og Hundemat is a meat product available here in Norway. It is a mixture of Salmon, Beef, Chicken, and Whale, dehydrated and mixed with vitamins. We have been very happy with that as well. The dogs eat twice a day. They get a light breakfast in the morning and their big meal comes in the evening or whenever we are done training. If we have trained overnight they get their big meal when we get back in the morning. We feed more meat than kibble during the winter, with a 70/30 meat to kibble ratio. We feed less meat during the summer, but the kibble amounts stay consistent year round. I like to be flexible. I want the dogs to learn how to go with the flow and not stress when something happens sooner or later then they expect. I want quality more than quantity. Quality training, quality food, quality time. As long as those three things happen the dogs are happy and (so) I am happy. I work with Alaskan Huskies. I have worked with everything from Sprinting Pointers to Sibes, and the Alaskans fit me best. Shy dogs drive me nuts. I will use hours every day for weeks to make contact a shy dog. I just can't stand knowing they are in the kennel. I like dogs that really like to be out running. I don't want dogs in the team that get down if we are camping or breaking trail. They don't have to be jumping for joy all the time, but I like dogs that don't go sour when the going gets tough. They do not have to be mentally super tough, but naturally happy and positive is perfect. Yoda was my first dog. He was this big gray dog that never quit and was like a rock in a team of complete idiots. He hated getting his feet wet. He would scream his head off if we went through a puddle on the trail. I guess my other favorite would have to be Tahna. She was my first good lead dog. She died last week at 18 years old. She was a tough old gal. The parents have to come from good dogs and have proven that they are good at what I want to do. The parents should be mentally and emotionally stable and be the physical type of dog I want. I try and only breed top dogs to top dogs. I do that because I want to have the best chance for having as many puppies from each litter make my team as possible. Frank Turner and Bill Cotter have lines of dog that I think are just about perfect. Do you use any pre-training evaluation of puppies? No. I think that, unless there is something obviously wrong with a puppy when it is born, I won't know what that puppies potential is before it is at least two. I will let them run free, and I, of course, make notes about gait and start to get a feeling for how the dog will turn out, but I have seen too many funny gaited puppies turn into silky smooth adults. So I try not to judge early. What method do you use for starting pups? I like to hook up a great big team to a car and use as much time as it takes to go a just little ways with them. I can use 2 hours to go half a mile. I just put on earphones and walk up and down the line stopping to play and untangle. I would not use this approach with puppies I had not raised from birth myself. My pups have done enough weird stuff with me by the time we harness break them, that harness breaking is really not that big of a deal for them. If they were born in the spring I will only do short fun runs all winter. I don't think I make it over 25 miles with them in a 24 hour period. The first year is not the time to push the pups. Using the first winter convincing them that running is the greatest thing in the world, and then pushing them a little their second winter, has worked well for me. What is the most important thing you look for in a young dog? A happy dog. If they aren't naturally happy as youngsters they probably are not going to be naturally happy as adults. I usually decide when they are between one and two years. Although, some dogs take longer to mature. I don't breed enough to have the luxury of selling away my immature youngsters, and I want to give them a chance anyway. I don't like selling a lot of dogs. Quality over quantity. I run hard, but make sure that the dogs have enough rest in between. I try and vary the training as much as possible to keep the dogs happy and engaged. Right now because I have a young team, I race to have fun and finish with no thought to placing. I will race to win in a few years. I can do it with happy, healthy dogs. Right now it is just to build up the puppies for the future. The ultimate goal in two years time is the Finnmarksløpet 1000. It is Europe's longest race and the worlds Northernmost race. Keeping the dogs strong and happy. I can travel much farther and much faster with strong and happy dogs than with fast and sour ones. If they are happy, I am happy. The gangline I suppose. My sleds are always breaking and my harnesses are all patched. I need someone to make me a sled I can't break! I choose based on which ones I think will challenge me and the team the most. Not necessarily based on competition but terrain and weather conditions factor as well. I am pretty easy to please, which I consider a strength. As long as the team is happy and pulling, I don't much care about speed or placing. It took me a long time to get to that place though. I am not afraid to run up hills. I am historically terrible at taking care of myself. I will snack the dogs every other hour, go through hours of checkpoint stuff, massaging and rubbing down sore muscles, before I remember to eat and drink. I have needed to make snacking schedules for myself so that I have enough food and fluids in my system. 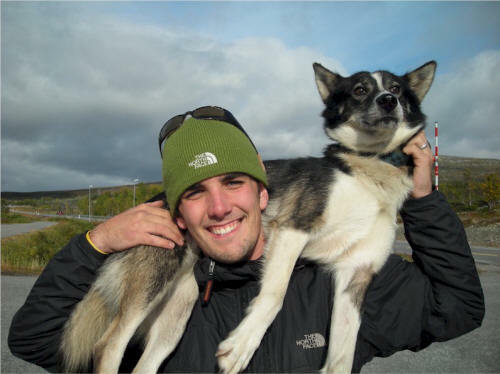 Do you have a mushing career goal? My biggest career oriented goal would be to win the vets choice award at the Finnmarksløpet for which I would need to place in the top 15. I would rather have that than have a win at that race, although a win would be nice to. I would like people to remember me and my dogs as tough and positive. Otherwise, an Iditarod finishers belt buckle would be great. I think I know, but until I start winning I don't feel qualified to say! For me, I won't have won anything unless the dogs finish happy and healthy with something left in the tank. I think things will stay like they have been. The gear will change and races will come and go, but the love of the dogs will stay consistent. Respect your dogs and do it publicly. What advice would you give a beginning musher? Start mushing with someone. Don't just buy a bunch of dogs and stumble your way through it. Learn from someone who knows what they are doing. Tell us about one or two of your most memorable sled dog experiences. I had not trained with anyone else all winter long. I felt like the team was looking good and was getting set for the first race of the season, which for me was the second weekend in January. I asked a few friends to come training with their teams before the race. I considered both teams to be of equal quality to mine. My friends did not know the trail system and the trail was unbroken from the previous night snow fall, so I led out. It was cold, and the sky was clear as a bell. The moon was almost full and I was running without a headlamp. After about two hours a cloud drifted across the moon and I saw some of the most incredible Northern Lights that I have ever seen from the back of a dogsled. I turned to point them out to my friends and they were not there. After two more hours, I met up with my friends back at the kennel. They said that they could not keep up with me, and they hadn't seen the northern lights. I had originally wished for a training run together with other people, but this run with just me and the dogs breaking trail under the northern lights and full moon was just amazing. Any final comments about sled dog sports? This is an amazing sport we have here. I think people like Mike Ellis, Jeff King , Lance Mackey, Martin Buser, Ken Anderson, Robert Sørlie and Sigrid Ekran, (just to name a few) are the (public) human heroes of the sport because --even though they are performing at very high levels--the well-being of their dogs is still their top priority. I hope people aspire to that, more than they aspire to win. As these mushers have proven, it is possible to do both. Copyright © 1997-2016 Sled Dog Central, all rights reserved.